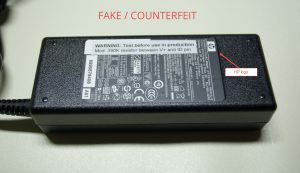 In this tutorial I will write about how to recognize a fake, copied or cloned HP laptop AC charging power adapter. 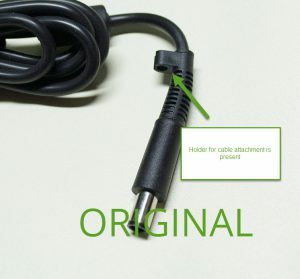 I believe this is an important subject since low quality Chinese knock-off copies of HP power adapters can potentially overheat or malfunction and present a serious fire hazard. They are usually made from low quality materials, internal circuitry is simple and lacks proper safeguards (over-current, over-temperature and short circuit protection), any kind of product quality control seems non-existent. Power ratings on these things are made up out of thin air since these adapters are not capable of providing near the advertised power. Do not let the appearance of the adapter or even the HP logo on the sticker deceive you, these things are easiest to copy by the counterfeiters, but as you will see; the devil is in the details. 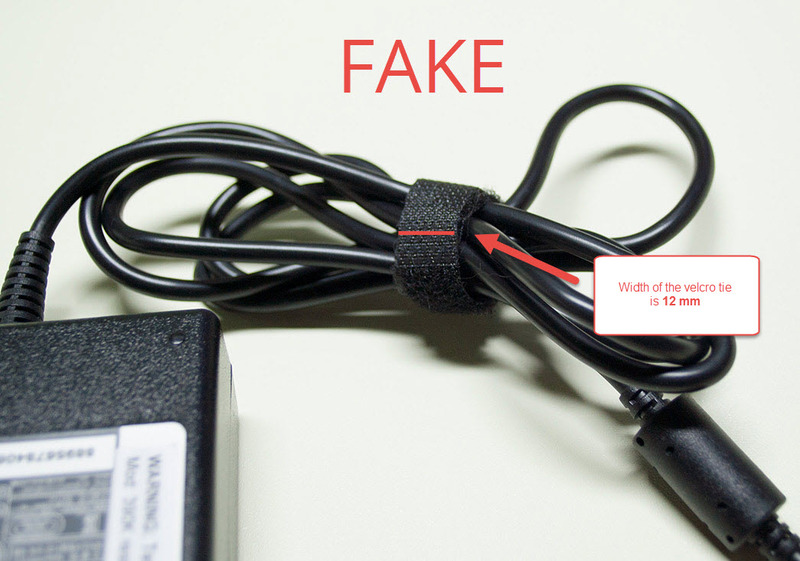 Fake HP 90W power adapter close up. Please ignore the custom warning sticker. Original HP 90W power adapter close up. A few months ago I have ordered some, what I thought to be, original HP adapters from eBay. 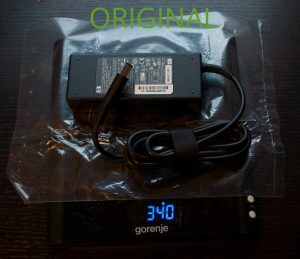 Ads title and description suggested that the 90W power adapters are original HP, but the price was a bit lower compared to the ones from other sellers. As I received the mentioned adapters and tested them on a HP laptop, I realized none of them was working. They were all missing the appropriate voltage on the middle or signal pin. 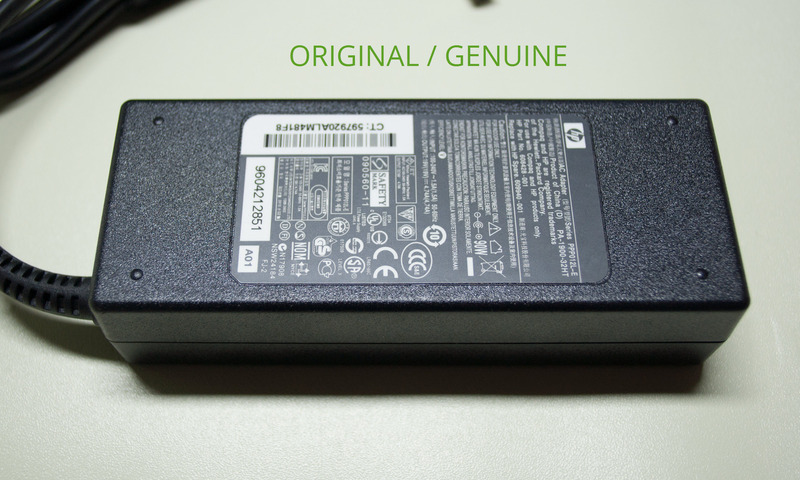 The mentioned ID pin is responsible for the “handshake” with the HP laptop, simply put, it tells the laptop it is an original HP Smart power adapter and that it can provide 90 Watts of power. After I received a full refund, I decided to open up one of these adapters and try to fix it by soldering a 390K ohm resistor between V+ and ID lines. This is a common workaround used by manufacturers of aftermarket power adapters to bypass the HPs Smart identification circuit. When I disassembled the first one, I quickly realized this is not a genuine HP adapter; it had a very primitive circuit, lacking few of the crucial safety components, something HP wouldn’t dare to afford. Nonetheless I have applied the mentioned workaround and the adapter started working, it was time to stress test it. 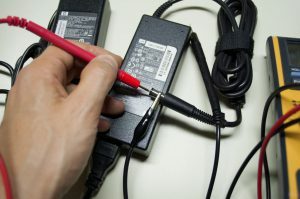 I connected it to a HP DV7 laptop with an empty battery and a graphic intensive application running; the total current draw was around 3 amps at 19 volts which means the laptop required around 57 Watts of power. This shouldn’t be a problem since the power adapter was rated to deliver maximum of 4.74 amps at 19 volts or 90 Watts of power at any given time. After a few minutes of stress testing adapter became scorching hot to the touch, two hours later I noticed a burning smell and adapter stopped working completely. In this simple tutorial I will guide you through the quick process of distinguishing fake power adapter from the original one, without opening it up or requiring any expert knowledge. Weighing the adapter on a kitchen scale is the most reliable technique, since fake power adapters are considerably lighter than original ones, because they lack quite a few components on the internal circuitry that add to the adapters’ weight. 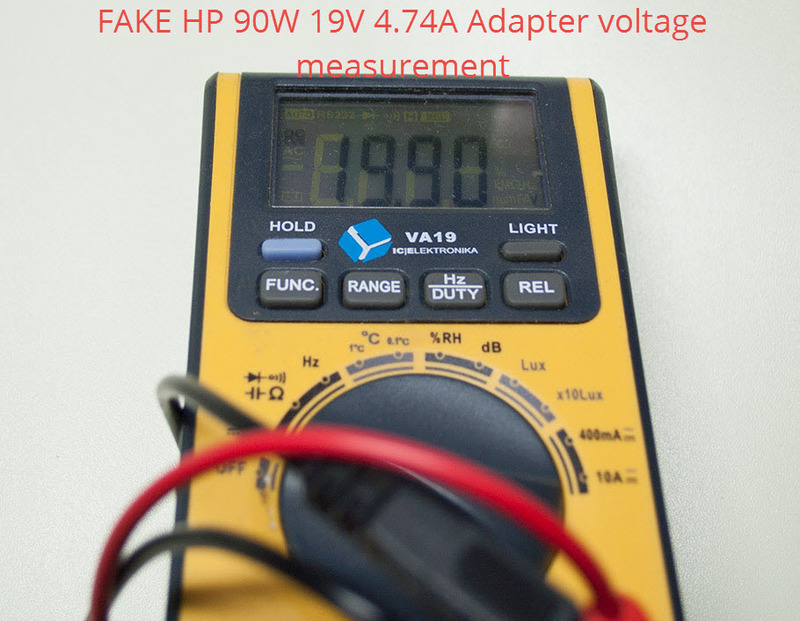 Weight of the original HP 19V 4.74A 90W Adapter with its complex internal circuitry is exactly 340 grams (0.749 pounds), whereas the fake adapter weighs only 230 grams (0.507 pounds). 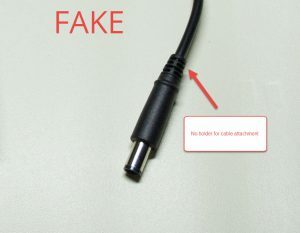 One of the missing features on the fake adapter is the holder for the cable attachment, which is a part of the power connector or power plug on the original adapter. Width of the Velcro tie on the fake adapter is 12 mm (0.472 in), whereas on the original one it’s exactly 20 mm (0.787 in). The use of a digital or analog multimeter is required for this step. Put your multimeter in a DC voltage measurement mode and connect the negative probe to the outer side of the connector and positive probe to the inner side of the barrel (be careful not to touch the middle or ID pin). 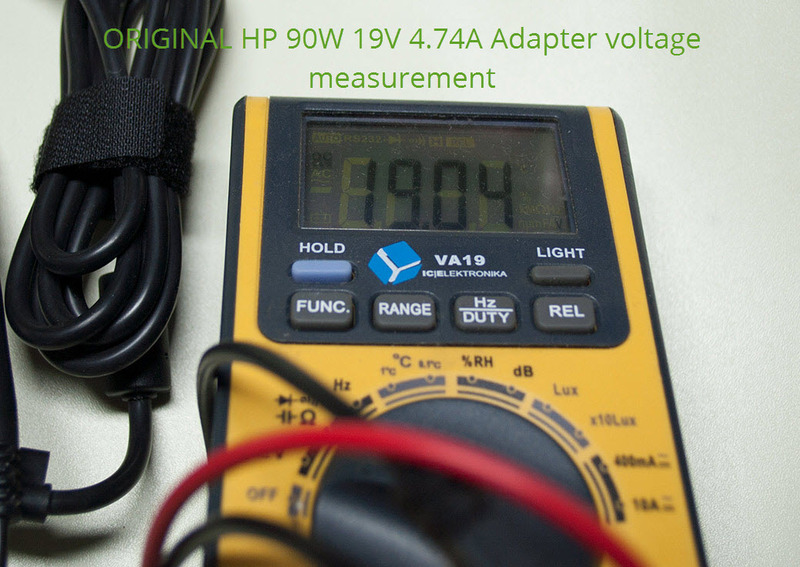 Measuring output voltage of the power adapter. The output DC voltage of the original adapter is around 19.04 V and is well inside the specifications, whereas the output voltage of the fake adapter is at 19.90 V which is almost 1 volt over the specified voltage. Thank you very much, this was really helpful. I really didn’t want to buy a knock-off. Guess i’m carrying my multimeter to the store. You are welcome, I’m glad to hear it. Thanks for your valuable information. It really very easy to observe. I’ve bought a universal Car Power Adaptor for my HP DV7. 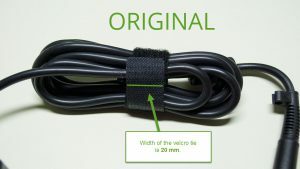 unfortunately, what looked like the right connector turned out to be smaller. I have a Genuine Power Cable (from an old HP PSU that failed at the grommet), so was thinking of using the 390K Resistor hack to force it to recognise it. Do you have the calculation, to be able to confirm the correct resistance with the Car Power Supply? if you have access to a digital multimeter, it should be really simple. 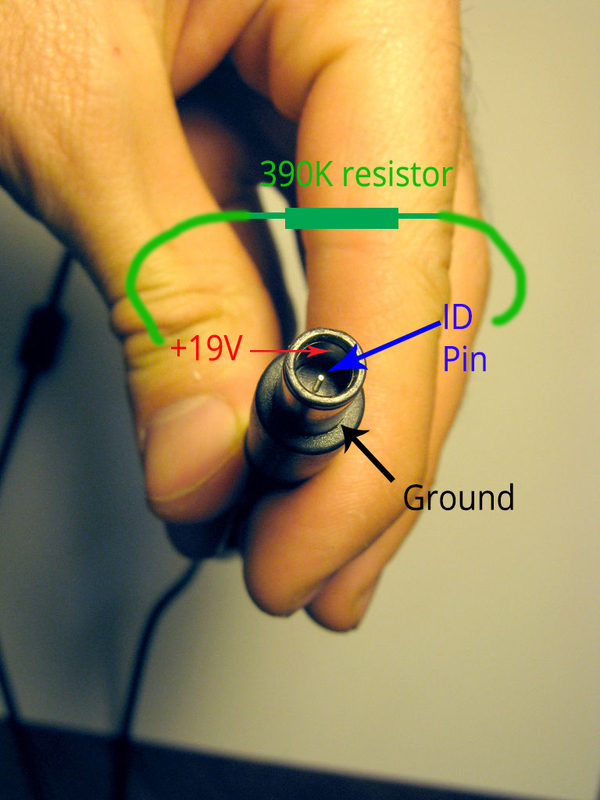 The 390K resistor goes between the VCC and ID lines, as shown on the picture below. After you solder the 390K resistor between the VCC and ID lines, your multimeter should measure 390K of resistance when touching the VCC with one probe and ID pin with the other (adapter should not be powered during this test!). ac adapter of all kinds..this will help out when sorting out those particular one. Thank you for your comment, I’m glad that you have found the information useful. Since you are dealing with large number of adapters, you are bound to come across the 65W version – please note that the weight of the original HP 65W Smart Adapter is a bit less than the 90W – its around 280 grams (0.62 lb). 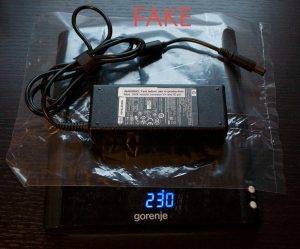 Weight is quite a reliable indicator of authenticity for different brands of adapters – when in doubt, search for weight specifications on manufacturers website and compare it to the weight of the adapter at hand.